From my notes I am reminded that the 29th December 2006, the day I went to Millwall to pay homage to Brunel, was cold and wet. As I stood on the riverbank I could see in my mind’s eye the Great Ship stuck on those timbers exactly 149 years before, with men working feverishly to launch what was then the most ambitious vessel the world had ever seen. It was a failed project in almost every respect, but for me the building of the Leviathan is the embodiment of the confidence Victorian England had in its engineers. Hang on, I hear you cry? With the British Isles as a dominating power at the centre of the Industrial Revolution it would surely be easy to find an example of confidence that was a success? True, but this particular enterprise has resonance for me; firstly because I worked on ships as a young man, secondly because I know what it is to be a project engineer, and thirdly because I worked with someone who had elements of Brunel about him. 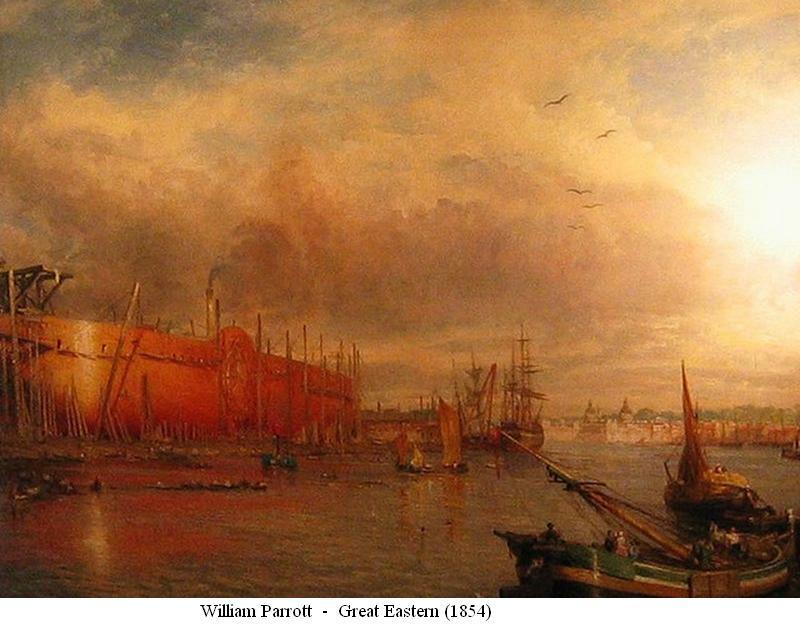 What was extraordinary about the Great Eastern was that it was built by a man overwhelmed by his belief in himself, and in that belief he was supported by a public drunk with his success. Daniel Gooch, Brunel’s right-hand man, wrote of him, “The commercial world thought him extravagant; but although he was so, great things are not done by those who sit down and count the cost of every thought and act”, which is quite true. Whenever people have a great deal of confidence they are not found on the edge, testing the water so-to-speak, they just jump in and do extraordinary and extravagant things. Of the many innovative ideas and engineering successes that were inspired by the construction of this ship I shall mention only one, the forging of the 40 ton crankshaft for the paddle engine. At the time no foundry in the world was capable of manufacturing so large an item and as Rolt points out in his fine book, Isambard Kingdom Brunel (Longmans Green, 1957), compared to the regular work of the day, this crankshaft was ‘a crowbar compared to a bent pin’. The task was finally undertaken at the Lancefield Forge, Glasgow where a special furnace had to be built and a battery of Condie moving cylinder hammers had to be installed (Rolt, p. 322). It epitomised the boldness of the era that even though the facility to manufacture this absolutely key component did not exist when the building of the ship began, there seemed to be no doubt in the mind of the designer that it could, and would, be done. But from a project engineer’s point of view the whole job was a disaster: The scope of the work was poorly managed; details of the design only came clear as building progressed and many of Brunel’s brilliant ideas could not be implemented. The contacts were poorly framed and the over-runs on the cost-of-works were always out of control. Rolt accuses John Scott Russell of being the villain of the piece and while it is true that Russell was not always honest, he appears on more than one occasion to have been talked into doing what couldn’t be done. Everything was late; on the planned day of the launch, 3 November 1857, the ship was expected to glide gently into the water but she got stuck and it was only after three expensive months of shoving and heaving that she was finally afloat. Worst of all was that the primary design criterion, that she should be able to sail non-stop from the UK to Australia, was obsolete. Even before the building of the ship had begun this requirement, that she should be able to carry all the coal she needed to make such a journey, had been superseded by the fact that there were secure, established coaling stations along the route. So what kept the project moving when it was clear that Brunel’s Great Ship would cost way more than expected and that it would not live up to expectation? How did Brunel keep raising money for what, to the average investor anyway, must have seemed a sure loss? Confidence I suggest… a confidence that could only have been carried in a society supremely confident in itself. 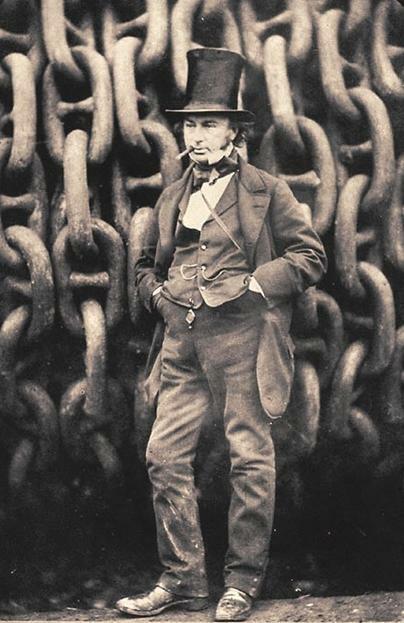 The kind of confidence reflected in the carefully staged photograph of Brunel standing in front of the anchor chains of the Great Eastern.